Aloha! Over a week has passed since I left the windy ridges and sandy beaches of Oahu. I am back to work, and all the stress that is connected to it hit me like a steam hammer and vanished almost all my recreation. However, all the good things I experienced in Hawaii will be in my memories forever. Not only the superb landscape with so many beautiful spots - I really love your beach parks with the english lawn - but especially your hospitality towards visitors are on my mind when I look back to Oahu. The BBQs and parties I had with you guys were great, and I would appreciate if Ray could send me the recipe of his marinade. It was awesome! 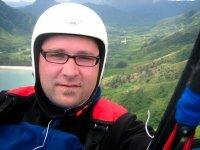 Unfortunately, I could not fly as much as I liked to, but I earned my wings in parawaiting and parahiking ;-) I had some very nice flights at Kahana and Makapuu, and landing on a beach is always something special for me. Flying to Pounders Beach gave me a lot of self assurance for further XC flights - I tried another one yesterday but didn't come that far. I will try to come back to Hawaii someday to fly with you again . . . I hope you call me or send me an e-mail when you plan to visit Europe. There is always a free couch for you in Karlsruhe. I am looking forward to flying with you in the Alps. Thanks a lot for the good time I had in Hawaii. Best wishes for the Rat Race and stay as you are. It was nice flying with you Marc, and I hope to see you again someday - maybe in your part of the world next time! Auf Wiedersehen! Come back soon, Marc. We enjoyed your company. When we eventually go to Chamonix, we'll let you know. Ya, we'll hopefully see you soon. If not in the Alps, then back in Hawaii someday. We haven't met but I wonder if you could help me out. I just purchased a paragliding helmet from Germany and I may need a translator because his request for payment was in German. Can you email me your email address.